Is Moneywiz worth it? I’d say so. There we are, simple answer to a simple question. However, those that don’t know what Moneywiz is might be scratching their heads at this point. What is it and why is it worth whatever it is? First impressions of the app are good. The interface is clearly laid out and responds well in portrait and landscape mode. 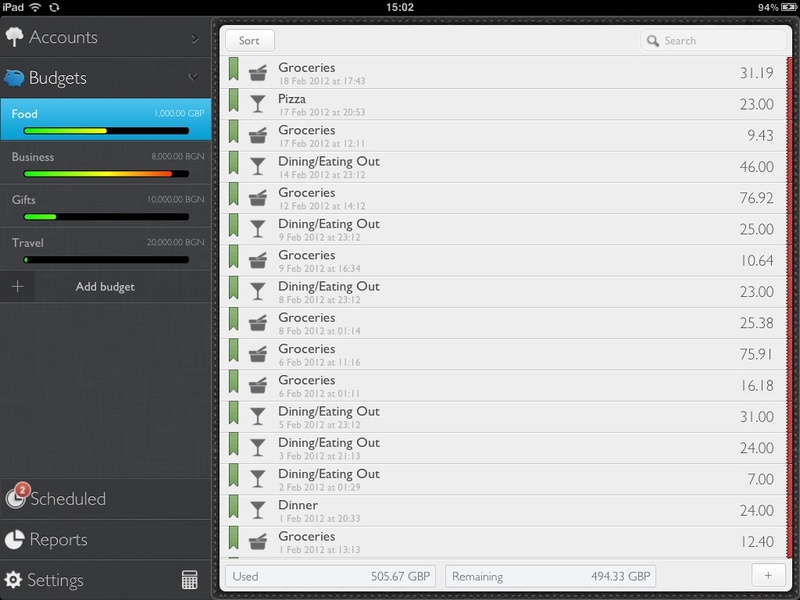 The picture above shows the design in landscape mode which allows easy access to the Accounts, Budgets, Reports tabs etc. In portrait mode, these are nicely hidden away but easily access as dropdown (is that the correct phrase for the boxes that appear on iOS?) menus to allow you to change. You’re first asked if you want to setup a syncing account – no dropbox syncing here unfortunately, a feature the developers won’t be adding. I had seen an explanation why somewhere but I cant seem to find it for you now! I believe it was for how the data is stored – as the screenshot above shows, date and times are added to each transaction. I therefore think that to avoid duplication or overwriting of the file, the files are merged, similar in style to using Git or another DVCS and which by having the time makes it a lot harder to duplicate transactions across different devices. (Dropbox would overwrite the file with the new version and if a conflict was detected, a new file would be created.) For those interested in reading about Dropbox and database syncing, the Silverwiz post I saw referred to this article for further reading. Anyhow, needless to say this isn’t to much of an issue as it still works fine and you don’t have to sync if you don’t want to. The app is very nicely laid out, adding new transactions is quick and it records your payee’s so if you do a lot of payments to certain payee’s, it makes it much quicker to enter transactions (for example, I start typeing Sainsburys into the payee box and it gives a dropdown list of payees starting with S then Sa then Sai as I type. Selecting it also fills in the description of the transaction as well, which makes it ideal when I’m entering regular grocery shopping). Accounts can be nested which works extremely well – I’m a fan of nested accounts as it means I can keep track of all car expenses in one main account etc. As far as the reports go, I’ve not found another iPad app that offers the range and custimisation of reports. I’m able to set months, between two dates, this year, last year and more! It means I can easily keep track of my details as I go. It’s quick to calcualte as well, though this could depend entirely on the number of transactions. Whilst Moneywiz is an excellent money tracking tool, it falls a bit short for those that also have shares, stocks or mutual funds (or non-UK equivalents). The available account options are as shown below. As can be seen, there’s no shares option there. However, I got around this limitation by using Google Finance to check my portfolio. Using this, it gives me the value of each share and my index fund so I just correct my “shares” account with adjustments every time I update it, using the value from Google. Not ideal but it works. Also, deleting an account deletes all transactions – GNUCash allows you to move them to a new account if you wanted. This might not be an issue for some people but I change bank accounts (normally savings) each year to get the best interest. In GNUCash it wasn’t an issue, I started a new file for each year but I can’t do that in Moneywiz. So I find that I’m unable to remove accounts without deleting it’s entire transaction history. There’s no option to hide accounts from view either (which I wouldn’t mind and could potentially be the best option). Lastly, the app doesn’t allow exporting of the financial data – QIF and QFX files are able to be imported but currently you can’t export your own. Hopefully this might appear on the Mac app but in the meantime if you need to export the data, you’re stuck with it on the iPad in whatever form Silverwiz use for storing the data. Overall Moneywiz is a fantastic app. 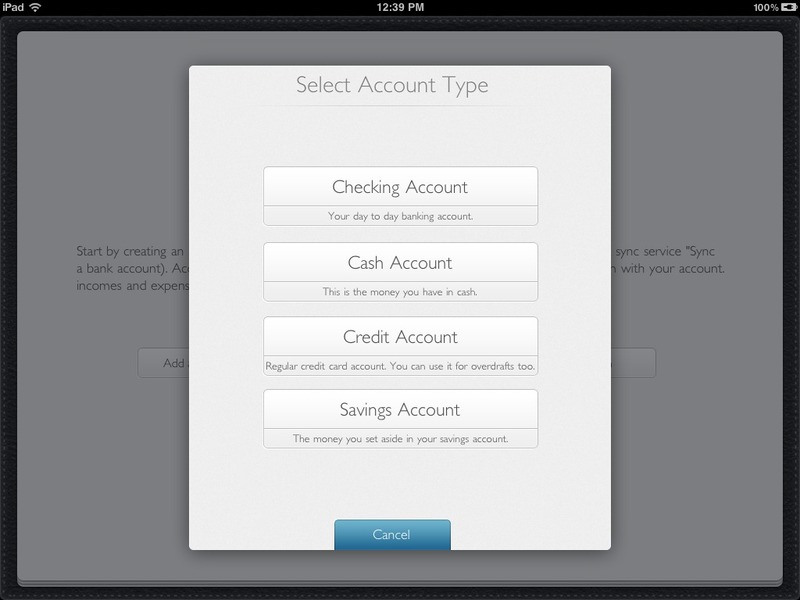 If you want to use your iPad to track your personal finances, you can’t go wrong with it. For the money, it offers excellent usability and news of the Mac app being released in April is good news for those that use the Mac for finance tracking. It’ll be good to see how the program ports over but if it’s as good as the iPad app, it’ll be a very serious competitor for any of the current Mac apps. It’s certainly worth looking at and at £2.99 is a bargain.